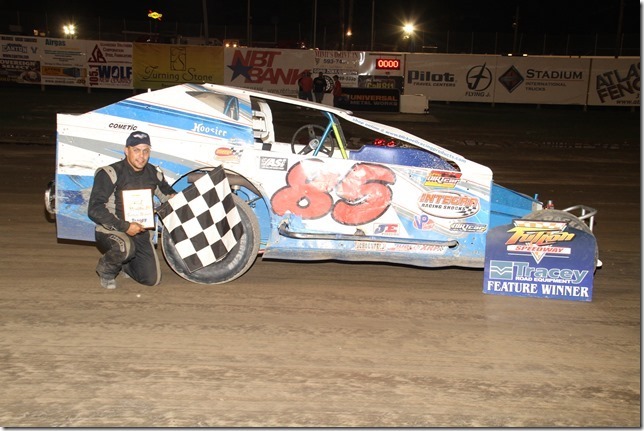 FULTON, NY – (By Dave Medler) – What a way to end the 2013 regular season at the Fulton Speedway Saturday. The night saw first time winners, a Modified team with no sponsors on the quarter panel go to victory lane, champions crowned, and one of the most popular drivers anywhere in Modified racing grab his first Fulton track championship. Winners on Tracey Road Equipment Night were, Dan Vauter, Tracey Road Equipment Big Block Modifieds, Jordan Bennett, SUNY Canton Sportsman, Brandon Ford, NAPA Late Models, Taylor Lamb, E&V Energy Novice Sportsman and Chuck Powelczyk, Four Cylinder Stocks. Track Champions for the 2013 Season are, Pat Ward, Tracey Road Equipment Big Block Modifieds, Beth Schneider, SUNY Canton Sportsman, Dale Caswell, NAPA Late Models, Gary Hoppins E&V Energy Novice Sportsman, and Skip DeGroff, Four Cylinder Stocks. Katelyn Kane in her rookie season in the Tracey Road Equipment Big Block Modifieds would lead the opening 8 laps of the 35 lap feature before Dan Vauter took over the top-spot on lap 9. By lap 15, Vauter was on rails on the extreme bottom of the speedway as he opened a half a straightaway lead on the field. Behind Vauter, Roy Bresnahan, Kane, Dale Planck and Chad Phelps were in a tight fight for second through fifth. At the halfway point, lap 18, Vauter still maintained the lead he had built up. Planck, Bresnahan and Phelps used every inch of the speedway in their battle for second through fourth. Kane was still running the best race of her rookie season showing in fifth. With 10 laps to go, Planck tried closing in on Vauter who was approaching back markers as the final laps started clicking off. Behind the top-two, Bresnahan, Phelps and now Ryan Phelps who was contending for the track title was doing all he could, as he showed in fifth. Over the remaining laps, and no yellows to tighten the field up, Vauter was able to put lapped cars between himself and Planck to pick up the win. Dale Planck, Ryan Phelps, Chad Phelps and Larry Wight who started at the tail completed the top five. After the final points were tallied, Pat Ward won the championship by 4 points over Ryan Phelps and 17 points over teammate Larry Wight. Of course Pat Ward was excited to celebrate his first Championship at Fulton, what made it extra special for him was being able to have his parents, Bud and Peg Ward and his brother there on the special night. Jordan Bennett would jump out to the early lead to start the 20 lap SUNY Canton Sportsman feature as he opened a six-car advantage at the end of the opening lap. With 5 laps showing on the scoring tower, Bennett still held the top-spot as Joe Kline ran in second trying to keep Bennett within striking distance. Behind the top-two, Brandon Ford, Ron Davis III and Jason Occhino were locked in a tight race for third through fifth. At the halfway point, lap 10, Bennett was on rails out front as he opened a full straightaway lead on the field. While Bennett looked to run away and hide, Davis, Kline and Ford were still racing in tight pack as Occhino showed in the top-five. When the starter showed the field 5 laps to go, Davis cut Bennett’s lead in half and looked to be the quickest car on the track. With 2 laps to go, Davis was within two-cars setting up a mad dash to the checkers with back markers just ahead of Bennett and Davis. Coming into three and four and exiting turn four, Davis was able to get a wheel under Bennett. Bennett didn’t flinch as he won the drag race to the checkers ahead of Ron Davis III by 0.192 of a second. Brandon Ford, Jim Spano and Tony Finch II finished third through fifth. Beth Schneider celebrated in victory lane after her first ever SUNY Canton Sportsman Track Championship with family, friends and her fiancé, Big Block Modified driver Robbie Bellinger. Aron Backus would lead the opening 6 laps of the 20 lap NAPA Late Model feature before Brandon Ford would take command of the race on lap 7. At the halfway point, Ford was running his best race to date in his rookie season as he bolted out to a half a straightaway lead on the field. Behind Ford, Backus, Alan Fink, Dale Caswell and AJ Kingsley showed in the top-five in a tight battle. A yellow would fly on lap 13 wiping out the lead Ford had built up. Most in attendance figured Ford would lose the lead with the heavy hitters of Fink, Caswell, Rick Miller and Kingsley right behind him for the restart. When the green came back out, Ford showed the savvy of a veteran and not a rookie over the final laps. Ford hit his marks every lap and beat Caswell back to line by almost two-seconds in the AMB scoring for his first career NAPA Late Model win. Alan Fink, Rick Miller and AJ Kingsley rounded out the top-five. Dale Caswell capped off his great season with the track championship by 24 points over Rick Miller. After coming close so many times, Taylor Lamb grabbed his first ever E&V Energy Novice Sportsman feature win. Lamb took the lead from Hilary Ward on a lap 5 restart, and then had to hold off first, track champion Gary Hoppins and then a late challenge from last week’s winner James Carlson for the victory. James Carlson, Gary Hoppins, Trevor Lindsey and Amy Holland rounded out the top-five. Wade Chrisman, Brandon Kuhn, Glenn Weaver, Joey Buonagurio and Kyle Kiehn completed the top-ten. 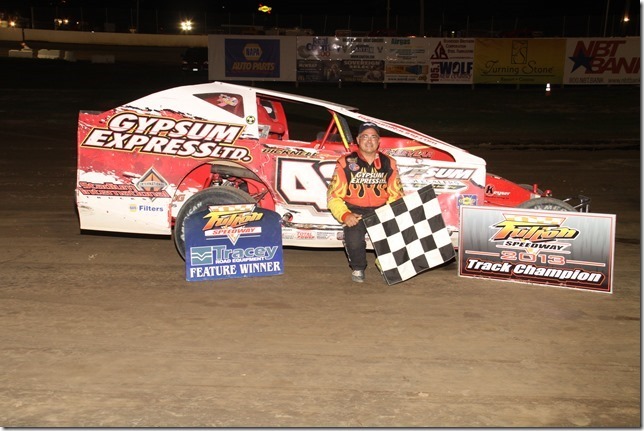 Gary Hoppins related in victory lane after celebrating with his family and friend his championship that in 2014 he would be moving up to the SUNY Canton Sportsman and NAPA Late Models. Chuck Powelczyk put another win in the record books taking the win in the Four Cylinder Stocks. Powelczyk took the lead on lap 4 and never looked back in the 15 lap feature. Justin Buske, Skip DeGroff, Eric Zirbel and Mark Johnston rounded out the top-five. After the race, Skip DeGroff was crowned track champion for the second year in a row. In just a little over a month’s time (October 4-5) it will be time for one of the most prestigious races anywhere in the Northeast, the 28th Annual Sunoco Fulton Ethanol Facility Outlaw 200 Weekend presented by SUNY Canton. For the race schedule, tickets, camping information and everything you need to know about the exciting weekend please go to http://fultonspeedway.com/ once there click on the Outlaw 200 tab at the top of the page. Any other questions you might have you can contact Cory Reed at [email protected] or 315-593-6531.